TWO (2) 2009 Honda RINCON ATVS and 2009 TRAILER for Sale. 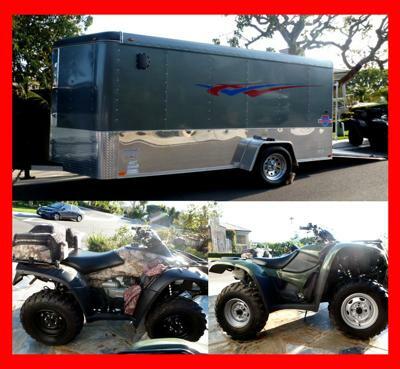 The 2009 Honda RINCON & 2009 TRAILER RANCHER ATV for Sale have many desirable accessories and upgrades including MAD DOG GEAR SADDLE BAG'S ON BOTH PLUS A FULL SET ON THE HONDA RINCON (680FGA8) WITH BACK PACK STORAGE. THERE ARE 4 NEW SAND PADDLE TIRES ("DUNES") AND WHEELS/RIMS THAT HAVE BEEN CUSTOM FIT FOR EACH ATV. THE TRAILER HAS LESS THEN 600 MILES and CUSTOM PAINT WITH GRAPHICS INCLUDING CUSTOM PAINT FOR THE FLOOR, PRIMER AND GARAGE GRADE PAINT. For more pictures and details feel free to contact me using the space below that has been provided by GoGoCycles Used Motorcycles for Sale (and PLEASE do not neglect to include your contact information in your email or to provide a phone number or email address!) so that I can respond with answers to your questions or after consideration of your best offer as quickly as possible. You won't find a nicer pair of used Honda ATVs with trailer for sale in Chicago Illinois, on Craigslist or in an Ebay auction so hurry and make an offer before it gets away from you! I'm leaving this ad up to ALERT potential buyers...please read the comments section for details. GoGoCycles would also encourage bikers to submit a review of the TWO (2) 2009 Honda RINCON ATVS and 2009 TRAILER for Sale to make the biker community aware of any problems that are commonly associated with the used Honda ATVs or the trailer or to highlight its positive features and help potential buyers make informed decisions. If you cant go look at them and see title with matching serial number stay away.